Subscribe to News on the Block Magazine. 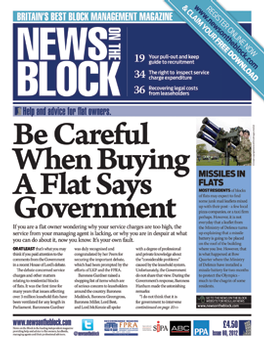 Your subscription includes online access to the magazine online, you will be emailed log in details by the Publisher News on the Block is the leading publication in the United Kingdom providing help and advice about flats.We provide specialist help on matters such as troublesome neighbours, service charges, lease extensions, buying your freehold, health and safety, maintenance ... in fact if there is any question a flat owner needs answering News on the Block will have the answer.We distribute 10,000 print copies of News on the Block six times a year. Each magazine is individually addressed and delivered by Royal Mail directly to our readers.. News on the Block Magazine subscription. Laundry and Cleaning News magazine is the leading business magazine for the textile care industry and a subscription to this magazine is a must have. Every edition carries the latest information about the laundry, dry cleaning, textile rental, OPL and launderette sectors.